Deferring income to next year. If your business uses the cash method of accounting, you can defer billing for products or services. If you use the accrual method, you can delay shipping products or delivering services. Accelerating deductible expenses into the current year. If you’re a cash-basis taxpayer, you may make a state estimated tax payment by Dec. 31, so you can deduct it this year rather than next. But consider the alternative minimum tax (AMT) consequences first. Both cash- and accrual-basis taxpayers can charge expenses on a credit card and deduct them in the year charged, regardless of when the credit card bill is paid. Warning: Don’t let tax considerations get in the way of sound business decisions. For example, the negative impact of these strategies on your cash flow may not be worth the potential tax benefit. Taking the opposite approach. If it’s likely you’ll be in a higher tax bracket next year, accelerating income and deferring deductible expenses may save you more tax. Who’s affected: “Large” employers, which generally include those with at least 50 full-time employees or the equivalent, as defined by the Affordable Care Act (ACA). However, certain midsize employers may be eligible for an exemption in 2015. The IRS has issued detailed guidance on what these terms mean and how employers can determine whether they’re a “large” employer and, if so, whether they’re offering sufficient coverage to avoid the risk of penalties. For example, to avoid the risk of a penalty for failing to offer minimum essential coverage in 2015, large employers need to offer coverage to only 70% of full-time employees, down from 95% under earlier guidance. However, the regs call for the 95% minimum to go into effect in 2016. Also, employers with 50 to 99 full-time employees or the equivalent can qualify for the exemption from the play-or-pay provision in 2015 if they meet certain requirements. For example, the employer must maintain the same health care coverage it offered as of Feb. 9, 2014. Even if employers qualify for the exemption, they still will be subject to the information reporting requirements that go into effect for large employers in 2015. Planning tips: If your business could be subject to the penalties this year or next, review your workforce and coverage offerings. There may be changes you could make to avoid or minimize penalties. Or it may be cheaper to pay the penalties. But remember that penalties aren’t deductible, and not offering health care coverage could make it harder to attract and retain the best employees. Finally, keep in mind that there could be more guidance or changes to the law. Check with your tax and health insurance advisors for the latest information. For assets with a useful life of more than one year, you generally must depreciate the cost over a period of years. In most cases, the Modified Accelerated Cost Recovery System (MACRS) will be preferable to other methods because you’ll get larger deductions in the early years of an asset’s life. But if you make more than 40% of the year’s asset purchases in the last quarter, you could be subject to the typically less favorable midquarter convention. Careful planning can help you maximize depreciation deductions in the year of purchase. Warning: The expensing limit and phaseout threshold have dropped significantly from their 2014 levels. And the break allowing up to $250,000 of Sec. 179 expensing for qualified leasehold-improvement, restaurant and retail-improvement property also expired Dec. 31, 2014. Congress may revive the enhanced Sec. 179 breaks. So check with your tax advisor for the latest information. 50% bonus depreciation. This additional first-year depreciation allowance expired Dec. 31, 2014, with a few exceptions. But Congress may revive bonus depreciation. Check with your tax advisor for the latest information. Accelerated depreciation. The break allowing a shortened recovery period of 15 years — rather than 39 years — for qualified leasehold-improvement, restaurant and retail-improvement property expired Dec. 31, 2014. However, it might be revived. Check with your tax advisor for the latest information. Tangible property repairs. A business that has made repairs to tangible property, such as buildings, machinery, equipment and vehicles, can expense those costs and take an immediate deduction. But costs incurred to acquire, produce or improve tangible property must be depreciated. Final IRS regulations released in late 2013 distinguish between repairs and improvements and include safe harbors for small businesses and routine maintenance. The final regs are complex and are still being interpreted, so contact your tax advisor for details. The accelerated depreciation provides tax savings now, and can be well worth the cost of performing the study. Every business and every building is different, however, and only a qualified team of professionals can help you evaluate whether your situation is a good candidate for such a study. Cost segregation study. 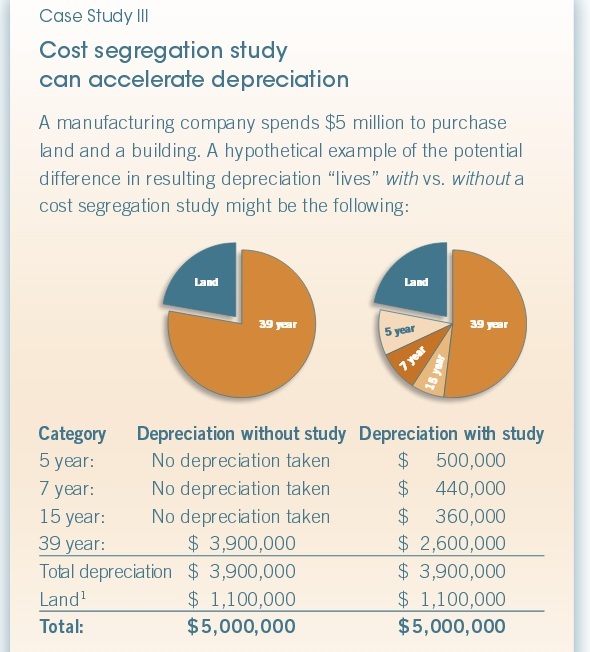 If you’ve recently purchased or built a building or are remodeling existing space, consider a cost segregation study. It identifies property components that can be depreciated much faster, increasing your current deductions. Typical assets that qualify include decorative fixtures, security equipment, parking lots and landscaping. See Case Study III for an example. Business-related vehicle expenses can be deducted using the mileage-rate method (57.5 cents per mile driven in 2015) or the actual-cost method (total out-of-pocket expenses for fuel, insurance, repairs and other vehicle expenses, plus depreciation). Purchases of new or used vehicles may be eligible for Sec. 179 expensing. However, many rules and limits apply. For example, the normal Sec. 179 expensing limit generally applies to vehicles weighing more than 14,000 pounds. Even when the normal Sec. 179 expensing limit is higher, a $25,000 limit applies to SUVs weighing more than 6,000 pounds. Vehicles weighing 6,000 pounds or less are subject to the passenger automobile limits. For autos placed in service in 2015, the first-year depreciation limit is $3,160. The amount that may be deducted under the combination of MACRS depreciation and Sec. 179 for the first year is limited under the luxury auto rules. In addition, if a vehicle is used for business and personal purposes, the associated expenses, including depreciation, must be allocated between deductible business use and nondeductible personal use. The depreciation limit is reduced if the business use is less than 100%. If business use is 50% or less, you can’t use Sec. 179 expensing or the accelerated regular MACRS; you must use the straight-line method. The manufacturers’ deduction, also called the “Section 199” or “domestic production activities” deduction, is 9% of the lesser of qualified production activities income or taxable income. The deduction is also limited to 50% of W-2 wages paid by the taxpayer that are allocable to domestic production gross receipts. The deduction is available to traditional manufacturers and to businesses engaged in activities such as construction, engineering, architecture, computer software production and agricultural processing. It isn’t allowed in determining net self-employment earnings and generally can’t reduce net income below zero. But it can be used against the AMT. HRAs. A Health Reimbursement Account reimburses an employee for medical expenses up to a maximum dollar amount. Unlike an HSA, no HDHP is required. Unlike an FSA, any unused portion can be carried forward to the next year. But only the employer can contribute to an HRA. Fringe benefits. Some fringe benefits — such as employee discounts, group term-life insurance (up to $50,000 annually per person), parking (up to $250 per month), mass transit / van pooling (up to only $130 per month, unless Congress revives transit benefit parity; check with your tax advisor for the latest information), and health insurance — aren’t included in employee income. Yet the employer can still receive a deduction for the portion, if any, of the benefit it pays and typically avoid payroll tax as well. A net operating loss occurs when operating expenses and other deductions for the year exceed revenues. Generally, an NOL may be carried back two years to generate a refund. Any loss not absorbed is carried forward up to 20 years to offset income. Carrying back an NOL may provide a needed influx of cash. But you can elect to forgo the carryback if carrying the entire loss forward may be more beneficial. This might be the case if you expect your income to increase substantially or tax rates to go up. Research credit. When available, this credit (also commonly referred to as the “research and development” or “research and experimentation” credit) generally is equal to a portion of qualified research expenses. Work Opportunity credit. This credit was designed to encourage hiring from certain disadvantaged groups. Examples of groups that have qualified in the past include food stamp recipients, ex-felons and certain veterans. Check with your tax advisor for the latest information on the status of these and other expired credits. Retirement plan credit. Small employers (generally those with 100 or fewer employees) that create a retirement plan may be eligible for a $500 credit per year for three years. The credit is limited to 50% of qualified startup costs. Small-business health care credit. The maximum credit is 50% of group health coverage premiums paid by the employer, provided it contributes at least 50% of the total premium or of a benchmark premium. For 2015, the full credit is available for employers with 10 or fewer full-time equivalent employees (FTEs) and average annual wages of less than $25,800 per employee. Partial credits are available on a sliding scale to businesses with fewer than 25 FTEs and average annual wages of less than $51,600. Income taxation and owner liability are the main factors that differentiate one business structure from another. (See Chart 3 to compare the tax treatments.) Many businesses choose entities that combine flow-through taxation with limited liability, namely limited liability companies (LLCs) and S corporations. The top individual rate is now higher (39.6%) than the top corporate rate (generally 35%), which might affect business structure decisions. For tax or other reasons, a structure change may be beneficial in certain situations, but there also may be unwelcome tax consequences. C corporations. Only income that shareholder-employees receive as salary is subject to employment taxes and, if applicable, the 0.9% Medicare tax. 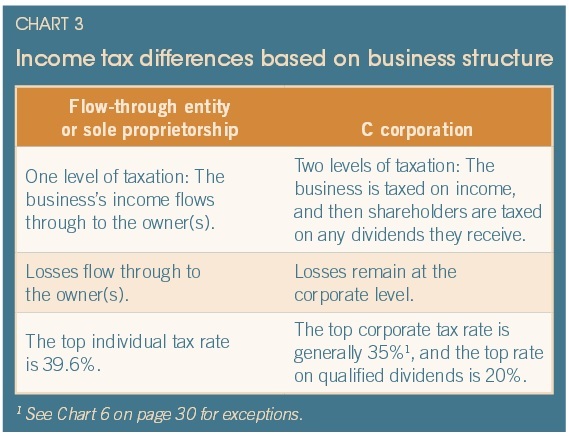 Nevertheless, you may prefer to take more income as salary (which is deductible at the corporate level) as opposed to dividends (which aren’t deductible at the corporate level, yet are still taxed at the shareholder level and could be subject to the 3.8% NIIT — see page 13) if the overall tax paid by both the corporation and you would be less. Warning: The IRS is cracking down on misclassification of corporate payments to shareholder-employees, so tread carefully. With a corporation, a key consideration is whether the deal should be structured as an asset sale or a stock sale. If a stock sale is chosen, another important question is whether it should be a tax-deferred transfer or a taxable sale. Of course, tax consequences are only one of many important considerations when planning a sale or acquisition. If you’re self-employed, you can deduct 100% of health insurance costs for yourself, your spouse and your dependents. This above-the-line deduction is limited to your net self-employment income. You also can take an above-the-line deduction for contributions made to a retirement plan (see page 22) and, if you’re eligible, an HSA (see page 4) for yourself. You pay both the employee and employer portions of employment taxes on your self-employment income. The employer portion of the tax paid (6.2% for Social Security tax and 1.45% for Medicare tax) is deductible above the line.